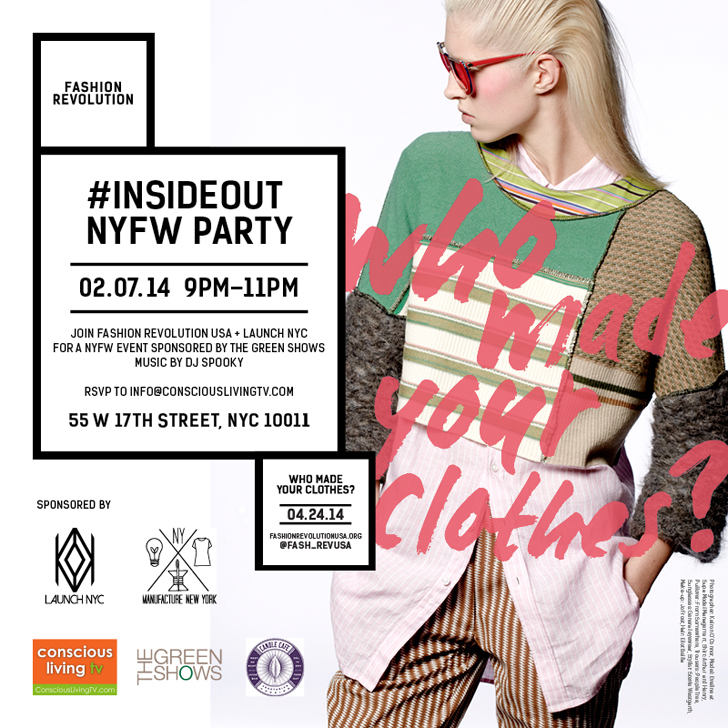 Kick off New York Fashion Week in sustainable style on Friday with Fashion Revolution Day, a worldwide movement that culminate in a series of events on April 24, the first anniversary of the Rana Plaza disaster in Bangladesh. Sponsored by The GreenShows and hosted at Launch NYC Fashion Week’s 5,000-square-foot pop-up retail, showroom, and runway space in the heart of Manhattan’s Flatiron district, the #INSIDEOUT event will feature installations honoring the 1,133 garment workers killed and over 2,500 injured in the deadly building collapse. Music will be provided by DJ Spooky, celebrated performer, artist-in- residence at the Museum of Metropolitan Art and executive editor of Origin. Treats will be provided by Candle Café, the first Certified Green Restaurant in New York City, as well as one of the top vegan restaurants in the country.